'Falaise', the Harry F. Guggenheim estate designed by Frederick J. Sterner and Polhemus & Coffin c. 1923 in Sands Point. Click HERE and HERE for more on 'Falaise'. This is off topic but has anyone heard what is happening at Winfield? Is there any sort of restoration of the fire-damaged rooms going on. How is the property being maintained? I have seen a few trucks at Winfield, presumably to do some work. What "restoration" if any, that is taking place inside is anyone's guess. Last time I noticed the windows were still boarded up. 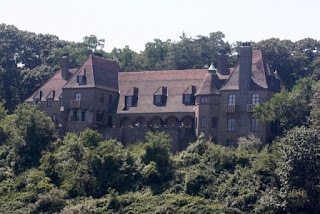 Considering the property appears to be a main source of family income, I think it would be a priority to clean up and get the mansion back in business. I highly doubt the destroyed interiors will ever be restored. Probably the gutted wing will finally get new wiring and a working bathroom, something that didn't exist prior to the fire. Speaking of Martin Carey's houses,I was by Bogheid a few days ago and a truck is back in the front yard. Guess it's back to being a parking garage. While working on LI this past spring I did the very first tour offered for Falaise in 2016. The rear of the structure has rebuilt Juliet balconies after Storm Sandy and the trophy room in basement still has some visible damage. They need to dark stain the very bleached colored wood used for the balconies so they don't look so stark and ill-matched architecturally. It's a fascinating place and worth the time to see it. That said for me there was a great deal of disappointment in the experience as I have wanted to see the place for years. Basically I was hustled through it [yet it was only me, on time] despite wanting to actually look at the rooms. Barely time to take photos in court yard or the pool. Unable to take outside shots of the rear facade facing the Sound. I expressed how lovely the stone stable (still in use) was to no avail of slowing down the jinty and taking a photo. My strong background in horse racing was to no avail when chatting about the trophy room. Instead the only remark was that the Kentucky Derby trophy was now with the Guggenheim Foundation. There is more to racing than that. At least eons ago I watched the America's Castle episode which gave as much detail and visual experience as any of the property.